Two Underwear Posts In One Day! Did He Really Want To Hurt Him? Courtesy of Universal/Motown, this week's Swag Tuesday trinket is rising pop star Mika's new performance DVD, Mika: Live In Cartoon Motion, now available online and at retailers everywhere. Live In Cartoon Motion, captures the star at his show stopping best, thrilling a sold-out audience of 4,000 fans at France's famed L'Olympia venue. Mika's Live In Cartoon Motion marks the first time the energetic star's lively show has been filmed in its entirety. Directed by Matt Askem (David Bowie, Paul Weller,) it captures Mika's flamboyant stage presence, with the star performing most of the songs from his 3 million selling worldwide debut album Life In Cartoon Motion, including "Relax, Take It Easy," "Big Girl (You Are Beautiful)," and the global chart-topping "Grace Kelly." Using 10 cameras and shot in high definition, the DVD also features a documentary chronicling Mika's escapades throughout his much heralded world tour, a highly-raved-about romp that the caused San Francisco Chronicle to proclaim the star "an incredible showman." 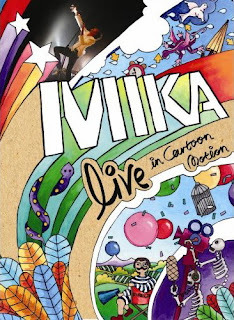 Enter to win Mika: Live In Cartoon Motion by commenting on this post. Only comment once and please remember to leave your email address. Publicists: If you'd like to take part in Swag Tuesday on JMG, please email me.